Our “Grande Experimentum” of the nWoD Dark Ages Kickstarter ended Saturday, and so most of what we talked about today in our meetings was reviewing the ups and downs of the experience of opening so much of the project to the backers. I’ll let you scroll down to the “Blurbs!” section below if you want to read about the many new chapters we added to the project. Up here, I want to dig a bit deeper into why I set up the KS as I did, and what we have discovered so far. RT: Two separate inspirations, or at least, thought processes. The first was feeling like even as fast as we were putting together nWoD projects, we just weren’t able to touch on every nWoD line and get it a new cool book. The idea of doing a new 2014 nWoD core line while we still hadn’t given new attention to Promethean, for example, just didn’t seem right to me. At the same time, we were having a lot of fun with several of our Kickstarters by getting the backers involved in suggesting new material for Stretch Goals, and sometimes in voting for which Stretch Goals we’d do next. But because of the nature of books like Mage 20th Anniversary Edition, for example, there was really only so much added material we could allow in these very tightly planned main books. But what if we created a Kickstarter for a book that was intended from the start to expand because of community input? It would be best if that book started out modular as well…what book could work that way that we were looking at on our schedule? There wasn’t one, actually. But there was a gap where I wanted to do a new big book that replaced the new supernatural game line of the year. So, if we…made a book that touched on each game line…by presenting a different historical era for each line…that would be the modular book we were looking for. Aha! Then we could have a Kickstarter that added to those base eras with more selected by our community. From there we test tried a whole raft of different voting and polling ideas until we hit on the one we’re using. So far, there has been a lot of really positive excitement generated by how we’re including the backers and community in this, so I’m really glad we went ahead this way. As I note above, we went through a lot of options for the voting, because there was some concern that the community involvement might be seen as wholly a popularity contest. We looked at trying to use pledges as an entry to voting, but that mostly meant we’d need to either have the votes be stated in the comments, or happen after the fact in a Survey. Neither of these worked, the Survey was too late for the sort of excitement I wanted during the KS, and having the votes in the comments would be far less scientific a process and potentially off-putting to backers who might not be comfortable with writing out their opinions in a semi-public forum. But the voting was always to my mind a key part of the value of this Kickstarter. It was where we could get immediate feedback from our backers and community. Fortunately, Impish Ian Watson was able to find us a widget for this site that could be used for voting (I’m guessing we’re going to use this a lot more in the years to come for more and different voting), and we hit on the sequence of announcing the poll choices, giving folks a chance to discuss the options, and then closing the poll as the Stretch Goal amount was passed. All of our Kickstarters are set up so that the Reward Tiers appeal to a wide range of backers. We know we have some folks who prefer PDFs, others that are into the traditionally printed books, and those who love the upper level Reward Tiers that provide more involvement in the project or game line. We hope that further rewards from Stretch Goals will encourage backers to decide to pledge for further rewards “up the ladder”, but don’t try and force that behavior. 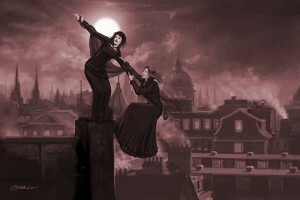 With Dark Eras, we had the further challenge of a community that was unlikely be excited about every Era in the book; folks generally like a couple of the nWoD lines which might not be enough to get a book like Dark Eras. Rather than fight that trend, we thought we’d accept it and offer the individual line chapters as PDFs for those folks and hope that the more they heard about the other Eras, the more the line PDF backers would consider a PDF of the whole book. We also could use the number of backers who backed each separate line PDF as a rough snapshot of the number of fans each line has, but we’re not looking at that as a definitive percentage or anything like that. We had a bunch of suggestions for new Eras from the writers and developers all set before we went live, and as the ideas came pouring forth from our community, I compared that list with the suggestions and put the first two ideas up for vote. We listened to the comments and I caught far more of a trend towards “either/or” than I wanted to hear, so the next poll had three suggestions to eliminate the head to head feel of the first poll. The next evolution was to try and give every option an even chance by not putting a game line that we knew was less popular vs options with more fans. Between Black Hat Matt, and Rollickin’ Rose, and myself, we worked up a set of options for which lines could be matched together, and that seemed to work well for the rest of the KS. It was a balancing act, because I didn’t want to unilaterally mandate anything and take the options from the community. After all, this was the idea from the beginning, and if Changeling has a huge and active fan-base, maybe it really should have more of the book. Buuut, we also didn’t want folks to feel it was futile to vote because their game would never have a chance. This was why we changed the polling software after we had a vote with 3200 votes but only 700 backers. A bit of discrepancy was expected as folks voted but didn’t back until they saw how things went, but that kind of gap suggested Macros and other methods that really were basically at odds with the spirit of this KS. 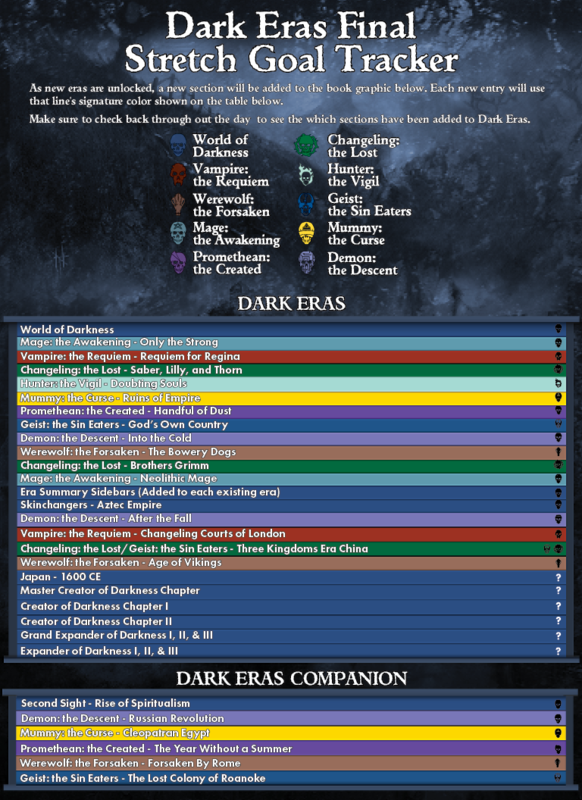 Similarly, I added a vote for just the Eras without attached game lines so we could, if necessary, include a game line that had not been voted in, and added the Reward Tiers where backers could buy the right to suggest Dark Eras without voting. Like I said, it was a balancing act. There were certainly many moments of drama as votes were tallied and new ideas were introduced. The community stepped up with so many ideas that if it hadn’t been for our backer Pineapple Steak compiling them into a spreadsheet, I’m sure we’d have missed a lot of them. By and large, this Kickstarter really performed extraordinarily well. Sure, there were some pretty bizarre conspiracy theories, like we had all the options already written (kinda would have ruined the whole point of the community involvement if we’d done that). Some people seemed to think Onyx Path was circa 1994 White Wolf and were going to write something with the awesome cultural sensitivity of WoD: Gypsies. The thing is, we pretty much expected that some folks would get a little sensitive, and others would be a little more competitive, but in the end it seems like most of our backers grooved to the very part we were excited about ourselves in letting our community really have a say in the contents of the book(s). That being said, managing that involvement was absolutely exhausting. We normally make a few Stretch Goal calls as things happen during our Kickstarters – in fact, I insist on staying flexible to better match the interests of the backers – but collating, deciding on which Eras to put in the polls, following those polls, getting those options put together and explaining things across our social media: our crew found this KS particularly tough. Yet, we really think it was worth it, and are really glad we tried this kind of KS. It might take awhile until we do another one that is quite this interactive in this exact way, but we’ll keep looking at ways that our community can be even more involved. If you look on the chart, the original book contained about 300 pages of Dark Eras, one chapter per existing nWoD game line, and everything after Werewolf in the 70’s was created by passing Stretch Goals and adding Reward Tiers during the Kickstarter. So backers are getting 300+ extra pages in the book, and then PDF and PoD coupons for the Dark Eras Companion that we had to create because we couldn’t fit any more Dark Eras into the main book. Woot! Promethean: the Created 2nd Edition, featuring the Firestorm Chronicle (Promethean: the Created) Being playtested. Sothis Ascends – Got Trabbold’s fulls in on Friday night. Getting all the files set up for Charles (new layout freelancer) so he can start cranking on them this week. Still have a few halfs coming in, but should be in well before we hit second proof. Book of the Wyrm 20 – Signed off on color corrections for the “art” portion of the cover. Came out a tad dark and so we had to lighten it a tad. Hopefully seeing the next phase this week. V20DA – Hopefully incorporating errata and sending off for indexing this week. T-Shirts – Working on WtFII Tribe and Auspice shirts. Should be a nice item to either release before WtFII or along side it. Art O’ The Changin’ Breeds – Mage still a priority. Fallen World Chronicle Anthology – Uploaded corrections and PoD files. WtF 2 – Fill in art is all in and placed. Fiction bits are done and some minor format tweaks have been made as well. Cover designed. Got proofing notes from Stew on Saturday, so I’ll be putting those in on Monday. We should be in second proof soon. Wraith 20 – Getting Mr Cobb started on remaining Guild logos. M20 – Proofing with Phil. 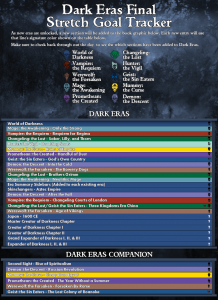 Dark Eras – KS wrapped up. Holding off on layout it until we get things finalized (expansions and sidebars in existing chapters being the big ones). V20 Lore of the Clans – Starting layout this week. Hoping I can make a big dent in it before M20 proofing notes come in. This is our next Kickstarter. Lore of the Deceived – Uploaded to Drivethru and awaiting activation..
M20: How Do You Do That? – Working on the art buy and pinging artists. EX3- RichT here, once again tagging onto Mirthful Mike’s report: Waiting on the last few pieces of art. Waiting for Dev notes on the roughly laid out pages. Ex 3 Anthology – Awaiting proofing notes. ◀ Dark Eras Kickstarter: 18 hours left! I have to admit I didn’t originally like how the voting was being done but once the IP thing was sorted out it all seemed as fair as you can get. And yeah I never figured some people might not like their votes to be known but you’re potentially putting your name out there and some people were angry about not getting wins, myself included, though I wouldn’t have gone all cyberbully the decision was left unavailable to those who might have. I thought it wouldn’t go as well as it did. Mostly because it stretches so many gamelines, and I figured people were more favorites of a few gamelines, rather than liking them all, and possibly actively disliking the ones they didn’t like, rather than being apathetic. I’m really glad it went so well, though. Always nice to have more points against the pessimistic parts of me. Also, REALLY looking forward to Werewolf 2e! I hope by this time next week I’ll be filling this comments window full of thanks for getting it out to us. I second that part about really looking forward to Werewolf 2e and hoping to fill the comments window with thanks for getting it out to us. On another note I did like the format for the KS and I hope that the ideas that didn’t make the cut this time around get a chance with another Dark Eras book in the future. I thought all the ideas were very interesting and while I placed my vote (when I was able to vote) on which I preferred the most out of the options given I did like all of the proposed eras. Without speaking of a full-fledged Dark Eras 2 book (or Return of the Dark Eras, or The Revenge of the Dark Eras), I hope Beast will have a Dark Eras-esque downloadble pdf some days in the future after its release. Because it would be sad to not have a Dark Era for it just because it was late to the party. Well, yeah, the corebook isn’t even out yet, but that’s just me wanting every line to have some Dark Eras love, that’s all. I really don’t know why folks are more comfortable with the mechanical anonymity of the poll, but they are. Maybe fear of cyber-bullying, maybe it just isn’t worth typing when you can click a choice. Pineapple Steak gets my vote for MVB (Most Venerated Backer). Also, really awesome with the Dark Eras KS. I mean, seriously. So much more goodness will be in the book thanks to us backers. Wait! It’s your favorite? Then we’re pulling the Hunter sections. We don’t want happy fans! I’m really happy with the way Dark Eras turned out. The original slate didn’t appeal to me much – too many Eurocentric eras and too many eras set in the 20th century – but the stretch goals did a good job of diversifying the book and even the new European and America settings had something to pique my interest. I’m really excited about learning how the mystery chapters and expansions are being assigned. It looks like the Ex3 Anthology is to book I’ll be looking forward to for now. Sadly, I’m not a Werewolf guy. Then again, Blood and Smoke made me fall in love with vampires all over again, so I might pick up the Idigam Chronicle eventually anyway. I think that folks will find WtF2 a very different…animal…than first edition. Thanks! Really nice Kickstarter experience for nWoD Dark Eras. The best I actually had ! Although I only saw my vote won 3 times in the whole process, it was really fun to see this book content being built progressively by the community. I hope you guys repeat the expérience from time to time! Good job Onyx Path ! Thanks, and glad to hear it worked for you! I wanted to throw this out there since you were talking about voting being a big part of the kickstarter. While I liked the voting in general, I found that I got the timing of the polls off, and definitely missed a couple. The e-mails seemed to be sent out before the poll was up, so if I clicked over I’d find an old poll, but then if I waited a bit to click over for it, I was never sure when it was ending and ended up missing it entirely. It’s possible I missed it somewhere, but by the end of the kickstarter there were a couple times I felt that I missed out on a poll that I really wanted to vote on. By the end of it, I was a bit confused as to when the polls were active and when they were tallied. The majority of the time I replaced the poll as soon as the changeover happened (or, in cases where we didn’t know by then, as soon as the update went out). I missed once or twice because I either wasn’t home or wasn’t awake when the changeover happened, but I did it within an hour. If you were still seeing an old poll when you visited, it may have been because your browser had the page cached. Ctrl-F5 usually forces a refresh without pulling from cache. I’m sorry to say that this was actually one of the first Kickstarters of any KS I’ve been involved in where I wasn’t very happy with the format. I liked the community input and I think our OP hosts were great and amazing. I was also incredibly excited for the proposed Dark Eras book. But the whole voting thing left me feeling a bit negative about the whole project. I should mention upfront that very few of my voted preferences made it into the book…and I heard at least one other backer post that none of his/her’s made it in. Even if I had been fortunate to have been a member of the herd/mob to get my desires in, I like to think that I’m the kind of guy that can see the other side of the fence to see what it would be like to be on the other side. I wouldn’t have liked that feeling either. First, vote for gameline order preferred for first round of stretch goals. Rank the lines in order of most votes to least and that determines which line is up for the stretch goals first. Second vote…starting with the top gameline from the first vote, offer up a selection of eras for just that gameline. Then you don’t have one gameline vs another gameline. Now it is about the eras specifically within that gameline. I still would hate to see so many options offered in polls, but not capitalized on in the end…however at least it would feel, to me, less like I was competing with fans of other gamelines. What can I say. There’s a reason I like roleplaying. I’m a cooperative player instead of a competitive player. Only my thoughts on the matter as I’d like them to be weighed in any future endeavors…and I don’t partake of the Twitting and the Facebooking. Thanks! I’m pretty sure you’ve covered your thoughts elsewhere as well, and sorry it was so frustrating for you. I dunno if the voting process you suggest would shift things in a way that you’d be happy(ier) with, it’s possible that this sort of thing just isn’t your cup of tea. Nothing wrong with that, and like I said, we knew going into it that some folks would not be comfortable with the project once the voting started. It was a pretty major concern that we tried to mitigate as much as possible. As someone who clearly was in the minority most of the time, I can’t imagine that any voting process will ever go my way. The whole poll/voting process was Lucy with the football…and I was Charlie Brown. I mean no ill will towards anyone…you wonderful hosts or the community at large. But while we’re discussing and voting, I’m just throwing out my one vote that we go back to how the other WoD KS were run, with a little less of a popularity contest to get content into the book. I trust the amazing authors to make anything grand. How many equally amazing ideas will never make it into a book if we rely on a minority win to decide? Like I said…no ill will towards anyone, just stating an opinion for future thought. It might not change anything, but I feel better. Whoops! Posting my Beckett’s post tomorrow. Wasn’t quite ready yet. Just throwing this out there… Samurai hunters vs ninja vampires. 1600s Japan needs balance those lines that lost out, right? Though I hope one of the advanced backers picks up the slack. Book of Judges Hunter was such a good idea. Yep, waiting to see, myself. Thanks! Any word on how along Phil is with the M20 proof reading? Did you get any work on on m20 screen? The notes are as the status is. While I’m ok with it taking as long as it takes, is there an estimate of how much longer? So far the offical response to that question has been silence followed by when its done. The official response has actually been that we do not give estimates to the completion of any stages because that way lies madness. My personal theory is they are holding back on M20 until exalted 3rd comes out, because reasons. Gotta say I had a lot of fun with this Kickstarter, though I did wait until Werewolf won one. Then to wake up a few days later to see we got two new lines. 😀 I hope Hunter is chosen for the Feudal Japan era, though I personally would like to see it be a Hunter/Vampire combination era. And speaking of Werewolf, W:tF 2e is so close I can taste it. I cannot wait! Good to hear! We’ll just have to see what we choose to do once we have all the backer picks in. Thanks! Do we have any hope of seeing Sothis Ascends before March ends? It is just going into layout now, so that’s unlikely as we try and give the layout guy about a month to go through several proofs. I just wanted to say thanks. Had you not pointed it out, I would never have realized exactly how much work went in to keeping track of everything and making this kickstarter as interactive as it was. So, thank you. You guys do an amazing job. And I’m sure I’m not the only one who appreciates it. You’re welcome. Or if you prefer, no- thank you! Either way, I appreciate your kind words. I actually wanted to put that info out in an Update during the KS because I thought it might help folks’ understanding, but then thought it might influence or alter the experiment. 1. Will there be Dark Eras listed for future gamelines in the World of Darkness? 2. When would be a good Dark Era for the upcoming Beast: The Primordial line? 2- I don’t know, haven’t read the complete text yet. Lore’s KS should start sometime in the next month, or maybe next month. Hope that helps! I’ll say, this week is shaping up to be an awesome week! Can’t wait for the WtF advanced PDF. How does that work btw? Do I buy the “real” version, and get the advanced PDF and the complete when it’s done? Do I do that on DrivethroughRPG? The advance PDF is the first release: you get it in advance of the final release. It might not be 100% complete (V20 Dark Ages’ PDF was sent to Kickstarter backers before we’d completed the index) but we want to get it out to people first and foremost. You buy it on DriveThruRPG as normal. Then for a couple of weeks we collect any errors, typos, and oversights that fans might find. We incorporate them and the other material like the index into a finalized PDF, with those files also being used to create the print-on-demand version. When the new files are uploaded to DriveThru, they’ll send you an email to let you know that the file’s been updated. If you see a recently-released product on DriveThruRPG which doesn’t have a print option, it’s probably still in the “advance PDF” stage. “Advanced” makes no sense. Thank you for making sure to point that out. Impish Ian is nothing if not precise in his terminology. I am, ahem, somewhat looser and prefer scientific terms like “that thingee” and “y’know, the thing that does the thing”, and so am a terrible burden on him. If I get it correctly what you are saying it will be similar in essence to what happens in the kickstarters with the backers getting advance pdfs there and replying with errors they find? Yep! The process actually started accidentally with our Kickstarters a year or two ago when we sent out an early PDF and backers started sending us the errors they found. We decided at that time to extend the process to non-Kickstarted products as well, and it’s been working out pretty well for us. Congratulations everyone on another hugely successful KS! Thank you for all your effort and care. It was pretty clear from the beginning (to me at least) that this was going to be a stress inducing undertaking, for what I think are obvious reasons, and you all did amazingly at juggling everything that needed to be juggled. I am talking to the financial backers here too, of course. I had some thoughts and a suggestion about the experience. I did intend to share them on the forums during the KS but my question was seized upon as an opportunity for flaming over the poll results and was prematurely shut down (somewhat over sensitively) by the moderator before I could share my ideas. Hopefully my comments will not start a similar fire here, its not my intention. Basically, after seeing several posts on gaming related sites calling for crowds to ‘vote for X I want it so bad’ it became clear that the poll results were not ultimately reflective of what the fans wanted because they were being skewed by the votes of people who had no interest in the final result. Instead, they were also reflective of the vigor of the social networks connected to certain games and the enthusiasm of those fans to pull in extra votes. Which makes Dark Eras even more interesting to my mind because its content is reflective of the spread of memes and the attraction of certain ideas over others (and not necessarily to the people who play nWoD). However as far as OP is concerned this is obviously not the goal or the intention and so I gave some thought to how polls could be more effectively used to represent only the wants and needs of fans. I reject the idea that only backers should be allowed to vote because in my case I voted on the polls and watched the book take shape to see if it gained enough content of interest for me to pledge, and I did so 3 days before the end. Taking part in the polls helped me to nudge it ever so slightly in that direction. I know that backers can pull out so I could have pledged and then voted in the polls, pulling out if I did not like where it went, but I still think the solution is to leave the polls open to the public. The reason why is that after some consideration I decided this was a matter of what is sometimes called ‘netiquette’, which is obviously a thing that is in its embryonic stages. And I would like to suggest that the answer is just to trust the collective to regulate and mature itself and when the next poll situation arises simply ask (firmly) that people do not request others who have no interest in the final product to vote. I believe that most people would see the sense in this and the end result would be a more accurate reflection for what the interested people want and need. Once again, my apologies if this causes any offense or trouble, it is not my intention, and thank you all for your effort and care in making this book. That makes sense. So I guess what we are talking about here is a balance between drawing in fresh fans (all good) and empowering existing ones to shape the content of things (also all good). Another ball to juggle, eh?. So I get why you don’t want to make the suggested request to people backing and voting. As a very old timer fan, though, I feel that maybe more could be done to shape future books with similar structures in the way they are intended to be shaped (i.e. by the ‘fans’ and not ‘by the internet’) – could, for example, backers votes somehow be given extra weight in the process? Or is that something that on balance is accounted for through the reading of comments in the KS by OP because the creation of the options in the polls is informed by that discussion? Where is the bottom line for such projects here, with drawing new fans or empowering existing ones, and how is the balance between them found? The balance being key, yes, my thinking was that we were very invested in reading the backer only comment section. Again, bear in mind that through the duration of the KS, there were voters who became backers because they got engaged through the voting. Being a backer meant we listened to you more during the selection of Eras, but we knew some folks were going to wait until the end as always and we wanted to see if we could draw them into the backer lists earlier by keeping the voting open. Maybe/might have worked. Still reviewing. One of the greatest and most joyful Kickstarter experience I ever had, I’m really pleased by all the process. Yay for the Secnd Edition of Werewolf. If I could say, will we know of the choices of the Master Creator, Creator, Grand Expander and Expander backers before we get the books/pdfs? The same for the japan chapter? It’s just that I don’t disagree with a little spoiling when it comes with the Wod. Yes, we expect to have that official info out to backers in an Update before the PDF is done. “Some people seemed to think Onyx Path was circa 1994 White Wolf and were going to write something with the awesome cultural sensitivity of WoD: Gypsies.” If you mean some of the questions about the Hunter Spanish Inquisition era, some of the material seems to endorse the “Black Legend” of the Inquisition, such as conflating it with the witch-hunting hysteria by claiming it was secretly hunting magic-users in the 10th century and having the civil witch-trials in Protestant Salem be directly descended from the Catholic Inquisition. Disturbingly, in “Saber, Lily, and Thorn”, the Spanish Inquisition is used as justification for anti-Catholic prejudice, just as the Black Legend was IRL. No, this point goes far beyond that. There were some people who jumped to conclusions without reading the material. That can and does happen due to the nature of Kickstarter and how much time people have to read the source material, but when there’s a lot of comments that feel as if the writers/devs aren’t trusted, it takes its toll. With respect to the Spanish Inquisition and Doubting Souls in particular, alternate history in an RPG boils down to the intersection of what actually happened, what was written about it, and how that applies to the World of Darkness. We did not specifically nor intentionally draw upon the Black Legend to create our source material, and I know Rose. I trust her, and know that she wouldn’t jump to a popular belief either. The reason why we wanted to tackle this Era, isn’t because we condone what happened–just the opposite. As game designers with a deadline, our purpose at Onyx Path is not to write historically-accurate books that will be studied at University. Though we draw upon history (and we used a LOT of books for this chapter than any other project I’ve worked on) we’re focused on fleshing out Doubting Souls within the confines of our word count to ensure it was a playable setting for the World of Darkness and Hunter: the Vigil. Conflict? Conflict makes fantastic fodder for games, and anything that deals with moral strife that may result in tragedy has a fair amount of that on multiple levels, that goes far beyond the physical. That is the heart of what Doubting Souls is all about. Like all RPGs and, in particular, alternate history settings, we trust fans like yourself will take what is presented and adapt it to your tastes. Werewolf 2ed, Yes! Great to hear its crossing the gauntlet as we speak. Also thanks for the generosity of providing essentially the full text of the books in your Kickstarters, I was going to back Dark Eras anyway, but it made me back Dark Ages 20 as well and I’ve never played the OWoD (I will now though), so just to say it is appreciated and makes a difference. No problem. We really have found that the more real material from the project we can share, the more folks get excited about the project and its Kickstarter. We probably have some small percentage of audience who just grab the text and leave, but I’m more interested in talking with folks like yourself who get engaged when they can read a bit. Or who just appreciate that we trust both the material to be good enough to entice you, and our audience enough to give them the text. Of course we do, you folks are why we do this thing. Woops, meant that to be a general comment. If saying it’s different in the game was valid, then nobody could object to WOD: Gypsies. In this case, history is being rewritten to reinforce RL popular myths and stereotypes, blaming actual groups for things they didn’t do. That’s never a good thing. Moreover, what does it add to a 17th century Salem Dark Era to bring in the Inquisition (Medieval or Spanish? Neither existed in New England) at all, let alone falsely blame them for the witch-hunting hysteria or invent a “Shadow Purge” in the 13th century that only lasted a decade? There’s paragraphs on them and only two mentions of Cotton Mather and one of Samuel Parris. If there was a deadline, the Inquisition should have been ignored. Actual historical organizational groups that we base fictional organizational groups on. A significant part of entertainment media is designed around exactly this, as has been the WoD (both versions) since Day 1. General Thunderbolt Ross hounding poor Bruce Banner using the US Army? Not a real situation that puts our military in a bad light. All of the X-Files. There is a significant difference between that and the treatment in Gypsies towards real life ethnic identities. Monica goes into the fine points, but suffice to say that: no, my remark was not intended to include you or that line of discussion. I’m still in shock that Mummy won one. I woke up after not having internet for days and saw that, despite the polls being pretty skewed towards the other options before, Mummy got a second era! So happy! O liked this kick starter…though would have REALLY preferred it was spaced out from the Wraith kickstarter. I’m excited for my book and the companion. We’re trying to intersperse cWoD and nWoD Kickstarters, but we’ve got so many cool Kickstarter ideas for this year that we just have to rock and roll with them! Well, guess I get to tell everyone to remake their characters on Friday. Aw shucks! Wow, and it IS Tuesday already. Wonder what Wednesday will bring? Sleeping was so hard last night. I’m so excited to have this book, I was checking every break I got at work to see if it had gone up; bought it over my lunch break. Thanks to the miracles of integrated technology and despite the fact that I was using a portable android device (*coughnookcough*) I was able to read it right then instead of waiting till I downloaded it and then transferred to the portable. I had totally forgotten about Pack creation (squeeee!) so, we’ll be able to revise characters without seeming too much like we’re remaking them. I may or may not have screamed in joy in the break room… thankfully no one was there. Vampire20: Lore of the Clans better get as much support as Dark Eras did. I want it to be 600 pages also. Very different products! And we pretty much are looking at very different Kickstarters to go with them. You should still get plenty of chances to interact with Lore, though. Just different. I’m really looking forward to that Kickstarter. I’ll be promoting it on Facebook and Twitter. I am so excited for the Idigam Chronicles advance pdf that I don’t know what outrageous statement to make first. Just make inarticulate animal sounds and howl a lot. I know I am a thousand years late but it was an important topic so I partaking now. Richt. First, your blog is awesome. Yes, I think the blurbs needed to be separate. As for content, the inside look to me is always best. Not for the scoop but because it encourages the spirit of transparency that you aim for the best. So your talks with Eddy and why did you do X instead of Y all are perfect fit I think. As a bonus, they allow us to see you guys as living and relatable (and awesome) people. You’re totally a week late! What the? Yeah. I know. Got stuck in the umbra again. You know it is. Relative space/time. Aha! Unmasqued. I always knew you were a timelord. Have to say that I really enjoyed this Kickstarter, not just for the immense community involvement but for how inspired it got me. I contributed some early ideas, including an Aztec Demon pitch, but it was really refreshing when fan suggestions crept up. Glad to hear it! I could certainly see in the comments during the KS that some folks’ gears got whirling thinking of the possibilities. And that’s certainly a great by-product of the KS. I had absolutely no intention of backing that… but the idea just got hold of me. I realize this may be a dunce question, but I’m curious about the Master of Darkness/Expander of Darkness chapters. Is there any info on what those chapters are about? I was one of those last minute pledgers, so if it was explained in the comments or updates, I didn’t see it. Thanks! They’re expansions of chapters / additions of new chapters for high-tier backers. Expanders get to pick a pre-existing chapter and a subject and get 5k words on it (or 10k, for Grand Expanders). Creators of Darkness get to “save” an era that didn’t win any polls. Master Creator of Darkness gets to come up with a whole new era for a gameline (though only for one gameline, and the era must be historically based). When will it be revealed the saved and expanded eras for the kickstarter? Once we know them and we’ve locked them in as what the devs and writers are working on. Thanks! The only thing I’m disappointed about is that I may have to wait until December to get this awesome book. Well done OPP! We’ll do what we can to stay tight on the time, but with so many chapters added, it’s like we’re doing two more books. No worries, that comment was sarcastic, I hope you spend as much time as it takes to make this book right! There was a lot of good stuff in this weeks monday meeting post. Wow.. where to start? First thing first: Werewolf the Forsaken possibly coming sooner than i thought: YAY! Big howl of great success! So now I will just bide my time waiting for this to show up on Drive Thru and pick up some other Onyx Path PDF’s I’ve been planning to get. Good times! Secondly: Congrats on Dark Eras! I think this will be a great one. Hunter and Werewolf will most likely be the big draw for me, but I will find inspiration in all of the stories and material spun by great writers.This will be a fun ride! Also got around to read the stuff on Hurt locker. Which will most likely be a very welcome addition to Werewolf and Hunter games Im running. Too bad there will not be a big focus on weapons and how they work. As it would be nice to get some updated rules on how bows work after the GMC rules update. We felt the old rules made bows quite OP in 1st edition. I do like what Im reading about making scenarios for combat. hopefully these can be done for rural and nature at a later time as well. Lots of good stuff happening with OP. I hope to see more good things for Werewolf the Forsaken 2nd ed in the future.With that I mean books. Tribe books would be very, very cool. Third: Glad you think so. The Dark Eras project went from being awesome to downright amazing over the course of the Kickstarter campaign. I can’t wait to see what else you all put into these chapters. Fortunately that wait can be tempered with Werewolf: The Forsaken in all its second edition glory. I want to send my sincerest thanks to Rich, Rose, and all the other people working on the Kickstarter. It was a lot of fun to be a part of it. Skolis-Ur is pleased with the coming of WtF 2nd. I can’t wait either. Maybe he’ll ease up on winter..or make us suffer through more to test our mettle. So with 2nd ed coming out I guess I need to get a 4th WtF tattoo..
Looks like it must have been a very exciting KS. Congratulations on almost tripling the pagecount, guys. You should have stopped by. Would have loved to see ya there. I loved this project. I really loved it. As an historian, I was very interested in it, and I’m more than satisfied with the results. Some polls were a hard choice, thought, and I was under the impression than, whichever winned, I’d won and loss simultaneously (as having to choose between Forsaken for Rome and Biblical Hunters). 1) Gameline Dark Eras. A book for each gameline including Dark Eras. Something similar to Grim Fears, but instead of characters, focuse in historical settings (something smilar to what Ancient Mysteries did some years ago in Vampire). Maybe you could include de losers eras o this poll in that book. 2) Instead of a new gameline each year, you could change that to a new limited historical setting run each year. An historical setting that could involve all the gamelines, or being centered in a different gameline each year, but including the other gameines in a sourcebook (and also other sourcebooks related). We’re still talking about just what the impact of Dark Eras might be, but certainly your suggestions are good ones. Thanks! The only downside to the suggestion that WtF2E may go up on Drivethru today is the fact that I will now spend the whole day frequently refreshing that web page. This is despite knowing that as I’m in a totally different timezone from most of you it will be pretty late in the day before its likely to appear. This, I am aware, is the very definition of ‘first world problem’ but it still makes me a sad fanboy. Now, since it is live, you should be happy! I don’t think that Onyx Path will ever produce a supplement like WoD Gypsies, but I do sometimes voice concerns about projects, especially when I back these projects on kickstarter. I probably wouldn’t bother if I thought the writers were lazy or racist. If doubting souls gets the expansion for Native American hunters (I think one of the people who put in for the era expansion KS reward tier is requesting that), I hope that the writers do more than just write a respectful, historically faithful chapter. I hope they take some time to talk to members of the tribe they’re writing about. As the linked article shows, sometimes dedication and respect aren’t enough. To reiterate – I don’t distrust the writers’ intentions or dedication at all. I loved pretty much every moment of the Dark Eras KS and look forward to reading what comes out. How things are posted, even your most heartfelt concerns, means a lot. We don’t know how much respect for, or confidence in, the creators you might have if that info is not part of your messaging. In this comment, in this context, your thoughts seem like a heartfelt request to really get in touch with folks who may have the best insight into the material. (Whether the creators have time to track down members of those tribes and what level of knowledge or insight those descendants may have that is relevant to our fictional world depicting their ancestors as monster hunters may be a whole other kettle of fish.) The constant demands we received during the KS read a whole lot more like the posters were lecturing the team not to be racists, though. You personally may not have meant that, but it read that way. Thanks for taking the time to respond to my comment. I probably was at fault once or twice in the KS or forum comments, and I’ll endeavor to more carefully consider what I write in the future. What about a dark eras book for the old world of darkness?